Be sure to get something special for your dad on Father's Day this year. 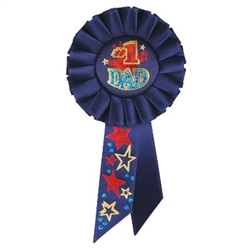 Get one of our #1 Dad Rosette Ribbons to show your dad thanks for all he's done for you. This dark blue silk like ribbon has bright colored stars to make the ribbon more bold. Dad will surly love it and will want to wear it around to show off his wonderful gift. Here at PartyCheap.com we have an assortment of things for you to choose from in the Father's Day items.